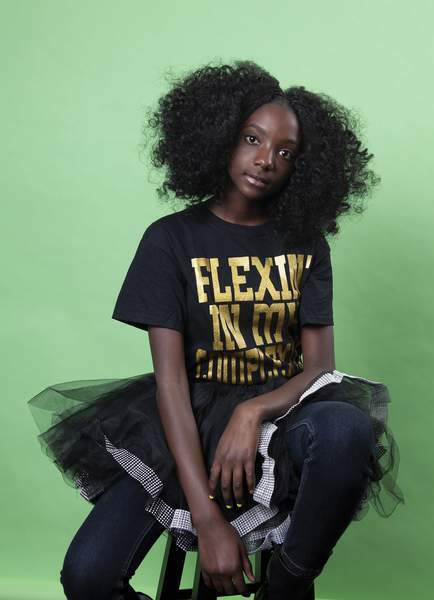 Associated Press Kheris Rogers launched a fashion line with uplifting messages after she was bullied in school over her dark complexion. NEW YORK – Kheris Rogers was in the first grade in a predominantly white private school in Los Angeles when she felt the bite of racism among her peers – she was being bullied because of her dark skin. She tearfully kept it to herself, eventually turning to her older sister, Taylor Pollard, and switching to a more diverse school, where colorism among fellow black students surprised and confused her. Soon, Kheris had her own Twitter and Instagram accounts (@KherisPoppin) and was posting photo shoots of herself that she and Pollard created. Her own fashion line followed, with T-shirts sporting her tagline, “Flexin' in My Complexion,” along with backpacks reading “The Miseducation of Melanin” and other apparel and accessories. Kheris was chosen as one of Teen Vogue's “21 Under 21” inspiring girls and femmes of 2018 and attended the magazine's teen summit. She was picked by LeBron James as one of 16 people to help mark his 16th shoe release with Nike, modeling in ads for the company. She's been featured in a spread in Essence magazine and walked the runway of “America's Next Top Model” after Tyra Banks learned of her plight.